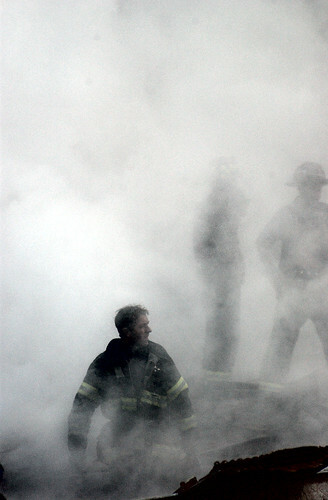 New York, N.Y. (Sept. 14, 2001) -- A fire fighter emerges from the smoke and debris of the World Trade Center. The twin towers of the center were destroyed in a Sept 11 terrorist attack. U.S. Navy Photo by Photographer's Mate 2nd Class Jim Watson. According to CNN’s Chronology of Terror, the first hijacked plane, Flight 11 out of Boston, Massachusetts hit the north twin tower of the World Trade Center in New York City at 8:45 A.M EDT. If you ask any person who was in the United States on September 11, 2001 where they were at precisely 8:45 A.M on that frightful day, chances are that they will be able to describe with precision exactly where they were and who they were with. Myself, as well as many other Americans vividly remember 9/11 and the events that surrounded it but it is surely not all that defines us. There are many other catastrophes that have happened in the world since 9/11/01, and there will be more to come in the future. The United States of America is not solely defined by 9/11/01; it is defined by how life has continued despite this disaster and how this country and its citizens have bettered themselves because of this tragedy. At the same time, in coming up on the ten year anniversary of this terrorist attack, we are reminded now more than ever of those brave Americans we lost on that day. As we remember and reflect on the people who were lost, the FBI examines terrorist threats made by al Qaeda that have threatened American safety. It is apparent that although this terrorist threat is “credible” and should be taken seriously, the American people should continue about their daily lives while remaining alert and cautious, especially in the New York City and Washington D.C areas. I hope that through the fear of this threat, the American people as a whole will continue to honor the fallen victims and remember what happened ten years ago. Through this time of remembrance and reflection, we need to be cautious and at the same time, not be intimidated by al Qaeda. As touched on by Jeff Jarvis of the Buzz Machine blog and New York City Mayor Bloomberg, the United States of America and the American people should not and cannot be defined by 9/11, even though it was a momentous event in history. We must carry on and live our lives without fear of the unknown.